• New security system v5 with precise range adjust (5 to 4096 meters) or Parcel/full Sim! 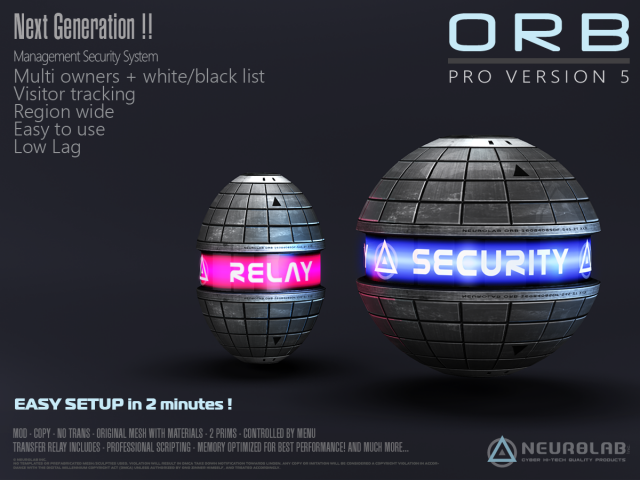 • Include relay “transfert permission” for eject peoples if you not owner! • Low lag + low cost: 2 prims only! ► Displayed @ our store ! • Orb relay « transfer permission » for eject peoples if you not owner and also control multiple parcels! • Light change colors menu but its fully mod if you want a precise color. • Only 2 Scripts! Professional Script memory optimization for best performance! • Permission: copy-modify – rez as many as you need. • A Beautiful Look for 2 PRIMS land Impact only!! ■ POWER: Turn on/off the ORB. ■ SOUND : Turn on/off the sounds Database. ■ ENABLED : = Activate/Desactivate security. ■ TIMER : = Change the time in seconds before eject someone. ■ GROUP : = Members of this group are auto-whitelisted (ON by default) . ■ ENABLED: Turn on/off the Scanner. This range is used for both Security and Scanner. People added to the blacklist will be ejected if Power is ON, even if the security is not activated. ■ COLORS : Choose the color of lights to Customize your ORB. Owner and each manager can decide if he/she wants to see the logs (intrusions and ejections) in instant messages. When you turn it ON it will check if there is an update and check it again every 24 hours. If there is an update you will receive it. Security allows you to eject people from your land. The ORB can not eject people from land owned by another person or group. While the relay is kept on this land your ORB will be able to eject people from this land. add people to the whitelist and the blacklist, edit the range, security mode, timer..
and then save the notecard. 3.2 Revision : Spam message removed. – Range added for scanner security.